The Age of Heroes by Scott J. Robinson. 2014. Ebook. 197 pages. Over the years, I've read many different fantasy books with wide variety of different settings, plots, and inhabitants, but I have to say that The Age of Heroes has managed to stand out from many of those books as something that offers not only an interesting world and variety of characters, but also a protagonist that is markedly unique from most other characters I've read. The Age of Heroes centers on the life of Rawk, a great Hero who is renowned for his celebrated deeds and battles against beasts and evils of all kinds. In this world, Prince Weaver has outlawed magic, leaving Rawk with even less to battle than ever before. Rawk is also finally nearing a point in his career in which he could--and is encouraged by some-- to retire, but Rawk is not quite ready to give up status as a Hero in return for becoming a "has-been." The story begins when a wolden wolf is spotted within Katamood (which hasn't happened in more than a decade) and Rawk is called in to take care of it. As I mentioned, Rawk felt unique from many others characters, and I really liked him! He's not necessarily an immediately likable guy, but I found him very relatable and I appreciated his confidence and dry sense of humor. I think we all have a certain amount of pride and would all struggle to give up doing something that has given us a strong, respectable reputation. I loved the concept of portraying a great Hero as a person that gets old just like the rest of us. Robinson has created an incredibly well-written story that immediately drew me in and kept me engaged. He introduces a brief but vivid world that he brings to life with his characters and the many creatures that are a part of it. I enjoyed the various encounters that Rawk faced in this, which included those that were both serious, frustrating, and a bit silly. I do hope that future books in this world further expand upon it, as I'd love to find out more about this world. There is a good mixture of humor and seriousness in this book that make it feel like a true adventure to be a part of. I loved how Robinson took the idea of a 'hero' trope and sort of turned it into something else that went a bit deeper and became more authentic. I also found a smaller subplot that regarded prejudices to be really thoughtful and well-written. This subplot eventually forced Rawk to reconsider some of his preconceived notions about certain races and open his mind to something more, which was a nice addition to the overall story. This overarching theme of change seems to be very prevalent. I really wasn't sure what to expect from this book, especially with the shorter length, but I am so glad I picked it up and had a chance to explore this world and the figure of Rawk. 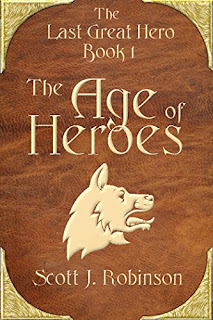 Overall, I've given The Age of Heroes four stars! Wow, that is a rare thing! I have hardly come across main characters portrayed this way, so I am itching to read it myself. Glad you enjoyed it, Jordan, and thanks for the rec!